One of my favorite things to do when I travel is to take long walks, exploring the corners of the city by foot rather than by any other means. When I studied abroad in Madrid, I’d often skip the metro and walk an hour to or from school, taking as many different routes as I could. Although I am a beach girl born and raised, I am fascinated by large cities. This weekend Mike and I spent Thursday through Sunday exploring one of the largest and most diverse cities in the U.S. – San Francisco. Our impetus for the trip was a wedding (number 6!) but given that we both have quite a few friends in the bay are, we extended our trip to last four days. We decided to save some money and rent a studio condo in Twin Peaks rather than stay in Union Square or another tourist-friendly area. As a result of our stay in a more remote neighborhood as well as our decision not to rent a car, we got quite a taste of the entire city. We took buses, trolleys, the metro and cabs in addition to countless miles on our feet as we explored the city and met up with various friends. 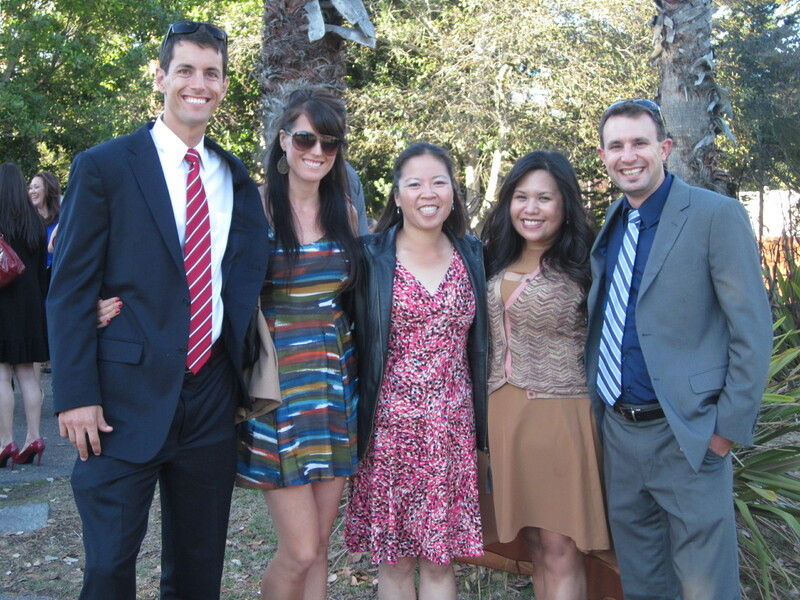 With Mike’s Friends at a Wedding at the SF Zoo! One of those friends was someone who I consider a friend yet we haven’t met in person. Kind of like online dating, fellow blogger Page and I have developed a friendship via the internet and when I told her I’d be in the city, we both decided it was time to put our relationship to the test with a face-to-face hang out. When Page suggested that we meet up for a run in the city on Saturday, I was more than happy to join her. Although my training plan only called for about 15-16 miles, Page’s Ironman training plan called for 18 “easy” miles and I figured a few extra wouldn’t hurt. Page sent out an email to some friends in San Francisco asking if they would be up for an 18 mile run at an “easy 9 min/mile ish pace.” Not only did they respond, three friends said they were up for the adventure! I am not sure I even have one friend I could email on Monday and ask to run 18 miles at a 9 min/mile pace with me that Saturday, let alone three! One of the friends mapped us a route, we set up a meeting time and I mentally prepared myself to keep up with these rock star runners. On the way to the ferry building! Since Mike is also racing Surf City in February, he got up with me at 6 a.m. on Saturday morning and made the trek via bus and then metro down to the Ferry Building in order to have time to get coffee and meet Page by 7:45. I was a little nervous as we made our way to meet everyone. 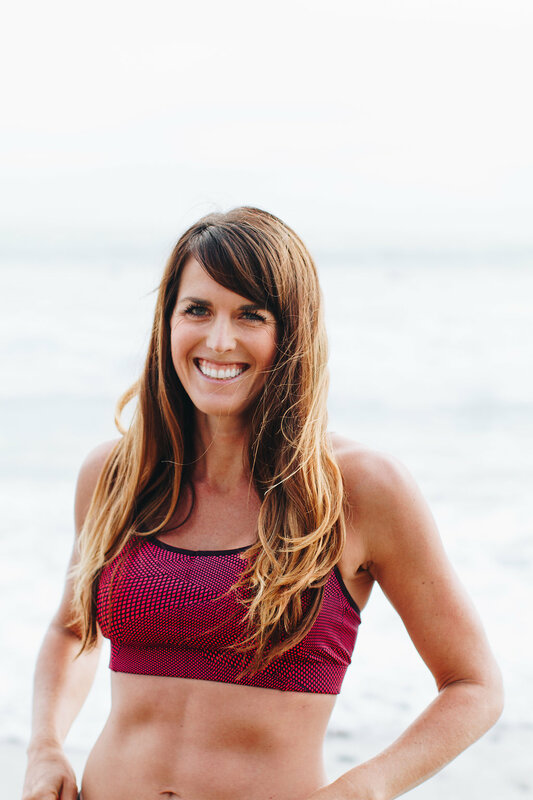 I was a little worried about the planned pace (although my marathon PR is a 8:45 min/mile, I typically don’t run my long runs near that time) as well as anxious to meet my “blog friend,” as I call all people I meet via the internet. Luckily there was no need to be nervous. Not only was Page incredibly nice, she was also really easy to talk to. And her friends, Kristin, Katie and Alyssa, were just as awesome. After a quick bathroom stop at the ferry building, we were off! 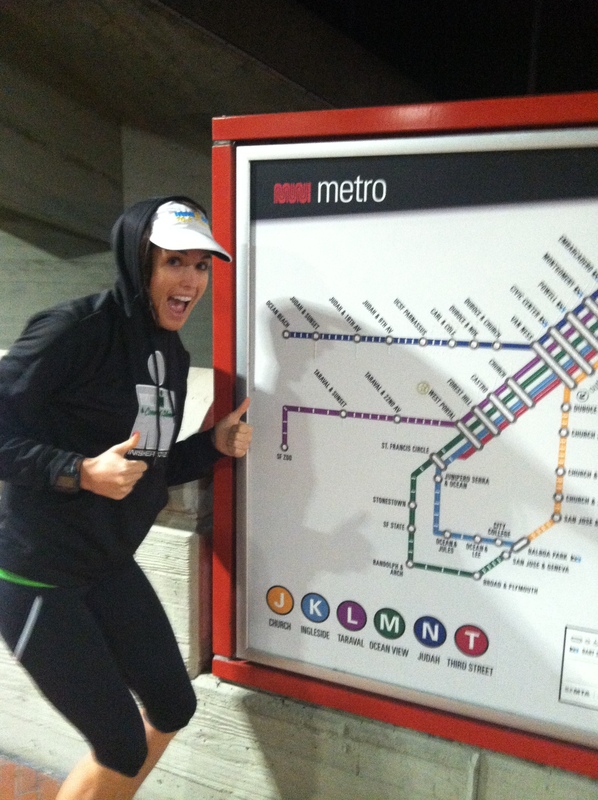 Our route was very similar to many of the San Francisco races (San Francisco Marathon, Nike Women’s Marathon, etc). We started at the ferry building, made our way down to the Marina and Fisherman’s Wharf, climbed a hill through Fort Mason, continued on along the water and then climbed up another hill and made our way over the Golden Gate bridge. The views were absolutely stunning and the weather was absolutely perfect. 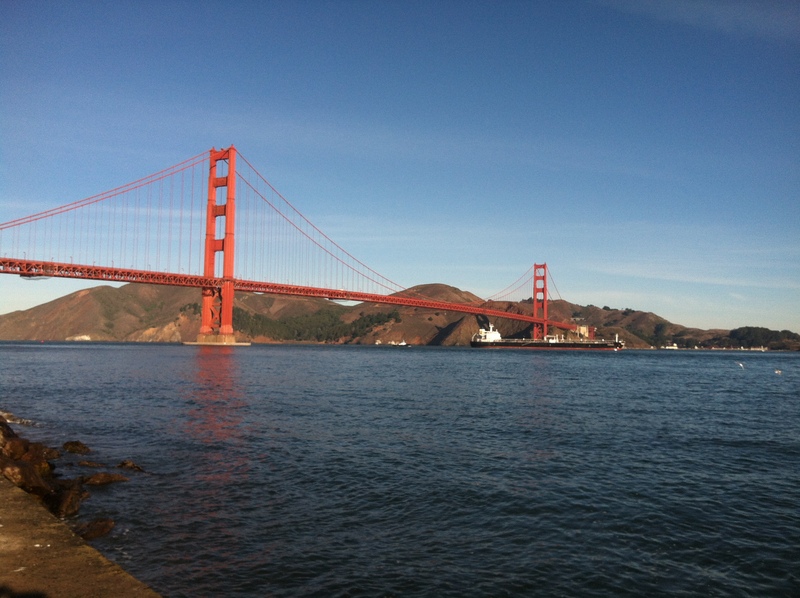 It was a sunny, warm and clear day in San Francisco. We stopped along the way to take pictures, use the restroom, fill our water bottles and chat. Once we crossed the bridge, there were more photos as well as the realization that we skipped our add-on and would have to do an extra 3 mile loop once we reached the ferry building again. We headed back, each of us changing position to chat with different people along the way. This run brought back a lot of memories of training for my first marathon last year with The Vavi Running Club. There were about five or six of us girls that would run together and chat and the miles flew by. We kept the pace easy, fluttering between around the high 8s and low 9s, and I found that my body was responding well. By the time we reached the Ferry Building, two of the girls dropped off but three of us continued. Mike was already back at the Ferry Building after doing 15 miles of his own, but we continued on for three more. We ran just past AT&T Park, which was even more exciting since the Giants were on the cusp of winning the World Series. Once we got back to the Ferry Building, my legs were tired, but overall I felt pretty good. We met up with Mike who ordered me a veggie burger while I went off with Page on a mission to find the vegan doughnut stand. After our meal, Page was incredibly nice and drove us back to our condo so we didn’t have to navigate public transit covered in sweat (not that the people on the trolley we took the day before smelled any better). The entire weekend was pretty amazing and packed with action, but I have to say my long run across the bridge with some pretty cool girls was one of the highlights for me! These types of amazing runs remind me of how much I love running. It makes the hard work worth it. Another highlight of the weekend (other than seeing all our awesome friends!) was the amazing food in San Francisco! We had no trouble finding amazingly delicious vegan food nearly every where we went! 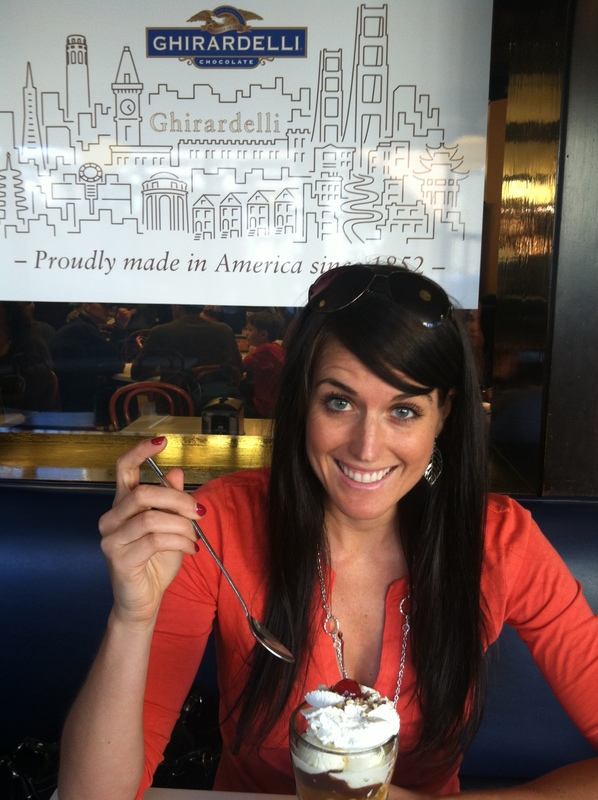 Of course, I also splurged on some yummy non-vegan desserts – you can’t go to San Francisco without a stop at Ghiradelli for a sundae! Do you go for a run to explore cities while on vacation? 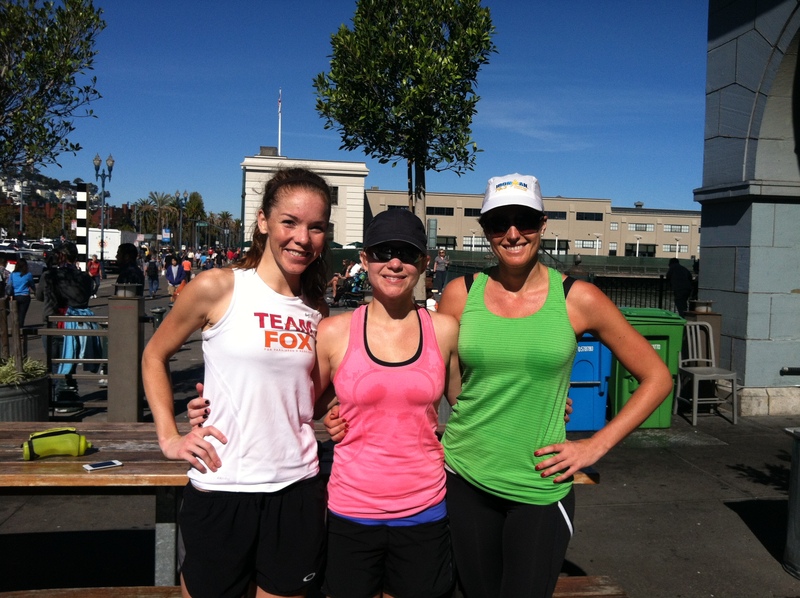 Have you ever met up with a blog or twitter friend in a city for a run? Yes hopefully we’ll be making it up again soon and I hope you join in for the race next year! Sounds like an amazing weekend! My fave way to explore new places is by foot, too. 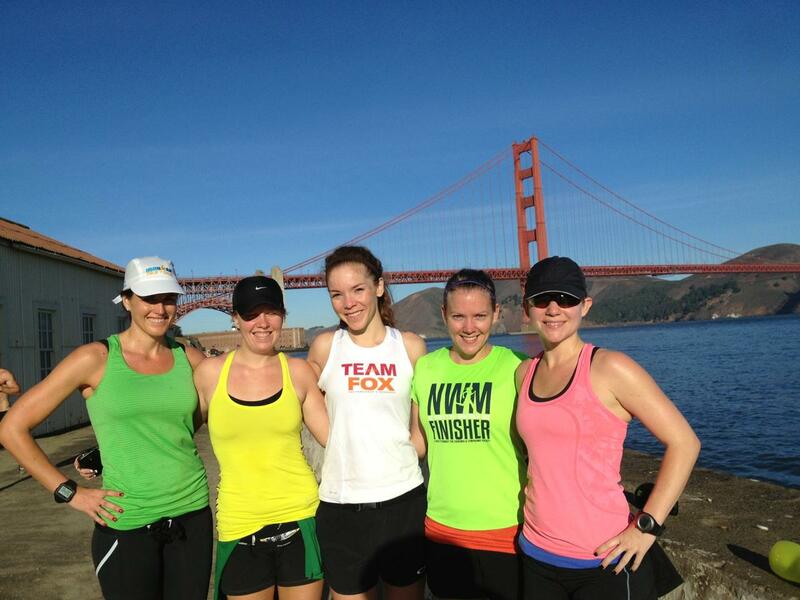 Your run sounds glorious, and it’s so nice you got to do it with new friends! 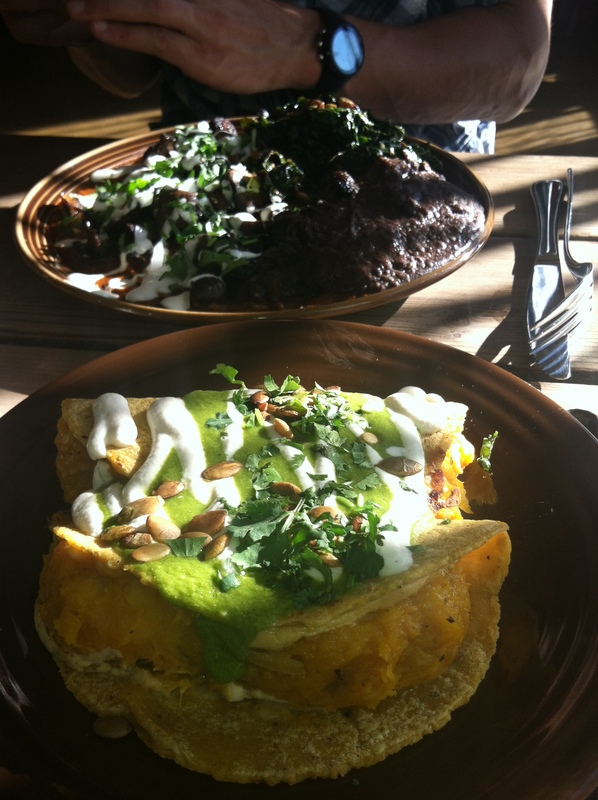 We were in SF last November and were so impressed with the vegan options for Kelly. They even had Asian vegan fast food in Union Square! I’m glad you splurged on ice cream! Can we just say that we are now BFFs?! Perfect and thank you! So so great to meet you and you enjoyed your time in NorCal. See you soon on our secret ROAD TRIP! Hope you had fun at the wedding & hope to see you soooon! awwww my home town! 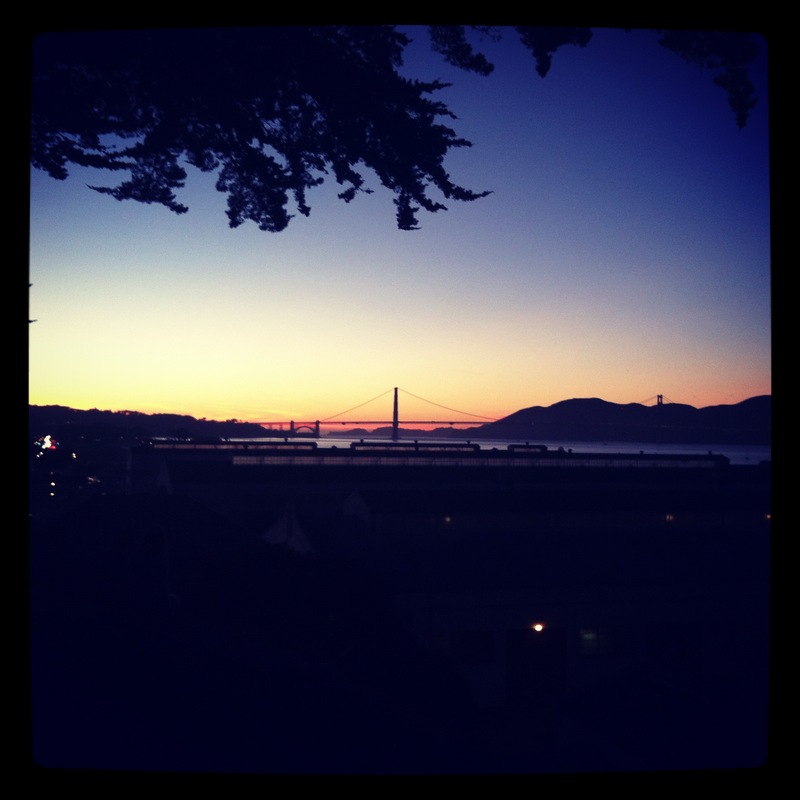 I miss SF! So cool that you got to meet up with everyone to run! You know several of the GOTR coaches are always in training for this or that. Tara (my glam partner) and Allison (coaches at Linda Vista now) are always training from once race and then the next and are up for long runs. I could say the same for me but I’m on hiatus. :oP BUT.. next year we should all plan some runs together! Yes I would love that! 🙂 You’ll be back at it soon enough. Sounds like a wonderful run! I am heading for my first time to San Francisco for a couple of days in a couple of weeks. Any suggestions on things to do, places to see or good eating? Well I’m certainly not an expert, but I would definitely recommend heading to Union Square, Fisherman’s Wharf (and Ghiradelli Square for a sundae) and the Ferry Building. Alcatraz is pretty cool for a tour but I think you may have to get tickets in advance. I’ve also heard great things about Golden Gate Park but I’ve never been there. Friday night while we were there we went to this amazing food truck gathering in Fort Mason park (Marina District) called Off the The Grid. The food was amazing! http://offthegridsf.com/ Have fun!